The last series of posts explored the role of destination as we organize ourselves – and our city habitat – for continuous improvement. In Destination alive or adrift, I proposed to cover the role of ‘purpose’ in a city, what makes a city alive, how we can tell when we are adrift, and the connection between individual work and city purpose. All of this to reveal why our work matters. Cities are alive with purpose. Higher order purposes give us something to latch onto, allowing us to focus, learn and choose. Higher order purposes are not precisely planned, but we do have an opportunity to shape them because the purpose of evolution is evolving. We are moved to improve our conditions and this takes place in a self-other dialectic; we pursue self-improvement and give to the wider community at the same time. This is the evolutionary influence at work. Evolution has a purpose that is co-created by the agency of humanity. This evolutionary impulse is alive and adrift. It is very alive in each of us, and the collectives of which we are each part, yet since we don’t know the purpose of evolution, which is itself evolving, things are also adrift. As Steve McIntosh put it, evolution “cannot be discerned with finality because it is still in the process of being determined by the beings whose choices are required for its creation (p. 161).” The highest order purpose, or destination, can not quite be defined because it is alive. Our short-term destinations and our bigger destinations are connected, with each of us, between each of us, and between each of us and the larger collective. There are scales of purpose in the purposes themselves and the scales of our social organization. The small is connected to the small – and the large. As we discern that the city’s destination is our own evolving purposes, it necessitates looking at our role – and purpose – in the city. To use Steve McIntosh’s language, each citizen, as a whole evolutionary entity, has intrinsic value. Citizens have value both as a whole, and as a fundamental part of something larger. As a part, it is instrumental. Citizens are of instrumental value to the intrinsic value of the city created by us. Instrumental and intrinsic purposes are evident at scale. The intrinsic value of each citizen is instrumental to the city. How we show up as citizens, showing up for our quest for survival and continuous improvement, for both self and others, is critical. If I don’t show up, then I affect my personal ability to survive and continuously improve as well as my city’s ability to do the same. Self and the city are only as good as we make them. Everything we do matters. Our cities are as good as we make them. Destination is simultaneously alive and adrift. It is most alive when we work from our passion, our inner drive to improve. When we catch glimpses of bigger destinations, for both self and the city, our direction, through short-term destinations, is discerned for fleeting moments. Between these fleeting moments, we feel adrift, which is to feel alive. How are you instrumental to your city? 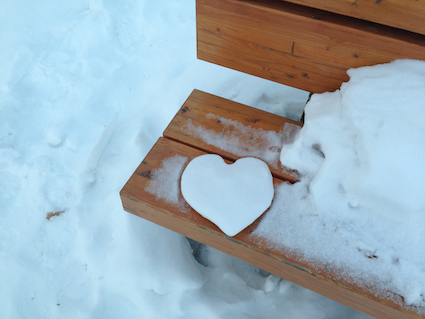 This little treat was waiting for me when I arrived at the edge of the river valley for my morning practice. From the edge of the valley, I really can see which way the wind is blowing. 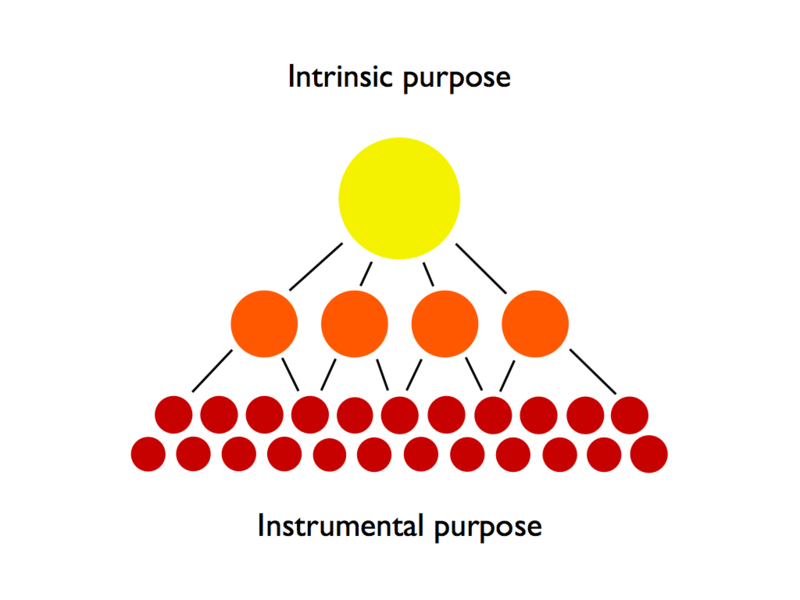 It’s time to boil down the philosophical theory of evolutionary progress and purpose after yesterday’s heavy post on instrumental and intrinsic purpose. What does this ‘big’ thinking mean to how we look our cities and our relationship with them? Steve McIntosh, on whom I draw heavily for this exploration of purposes at different scales, offers the language of instrumental and intrinsic purposes when looking at evolution at a macro scale. I take some liberties today to think about what this means for our cities. I’m zooming in, perhaps closer than McIntosh would, so the limb I am venturing out on is my own. In our city habitat, the large whole/holon is the city. It is made of millions of smaller wholes/holons that are both wholes and parts at the same time. 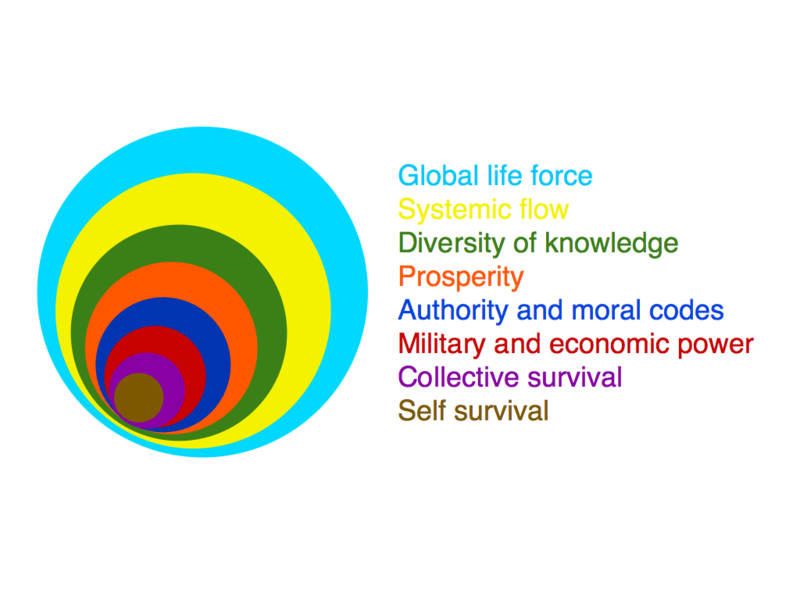 If you imagine the red circles as citizens, consider them as whole entities that form part of city. Just as the cells that make up our body are instrumental to our existence, citizens are instrumental to the existence of the city. Without citizens there is no city, and when we change our habits, we change our cities. Citizens are fundamental to the creation of cities. Cities, in turn, are significant and have an intrinsic, essential value. When we start to notice what the essential value of cities is for us, we start to see a different relationship between us and our city habitat. The essential role of the city is its role in our very evolution; while we create cities they in turn are helping create us. And so on. Simply by looking at the intrinsic value of cities, our role in them becomes increasingly instrumental. To organize for our own emergence, we need to consciously organize ourselves at the scale of instrumental citizens and an intrinsic city. Our work at this time is to figure out what it means to consciously play a role in both the well-being of cities and citizens. If citizens are not well, then our cities can not be well. And if our cities are not well, then we will not be well. It seems easy to recognize this as a vicious circle where we are helpless, but I choose to look at this appreciatively. Our cities emerge from us, we can look at this as a virtuous circle, where we choose to create what we wish to create. If we are the building blocks for our cities, what kind of building blocks do we choose to be? What do we choose to build? 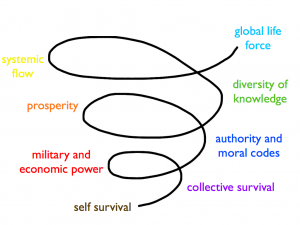 The evolutionary pattern of wholes, or holons, is helpful to understand purpose at scale. 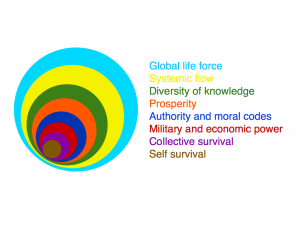 To explore this, I draw on the work Arthur Koestler, Ken Wilber and Steve McIntosh, who articulate the sequence of evolutionary emergence where each evolutionary entity, or level, is a whole and a part. Each whole is also a part of larger wholes. Marilyn Hamilton’s nested holarchy of city systems (Figure A) is an example. Holons, which are each whole, are nested as parts of other holons/wholes. The smaller wholes are more numerous. Imagine the cells that make up your body; they are far more numerous than the one whole body that is you. Likewise, you are one whole, along with many others, that make up the whole family to which you belong, or the organization where you work, or your neighbourhood or city, nation or species. In looking at the scale of wholes, that are both parts and wholes themselves, the smaller entities are ‘fundamental’ and ‘instrumental’. Without these smaller wholes to form part of the larger whole, the larger whole does not exist. The smaller the holon, the more fundamental; the more larger holons emerge, the more fundamental the smaller ones become. From an evolutionary perspective, larger holons are more significant than their smaller counterparts, while the small holons remain, and become, more fundamental. There are two value pulls here: one toward the smaller, fundamental value of encompassed parts, and a second toward the increasing significant value of emergent wholes. While these ‘pulls’ are in opposite directions, they are complementary; they co-exist in relationship with each other. As wholes become larger and more significant, the component wholes that are part of that whole become more fundamental. For McIntosh, this is the nature of evolutionary progress as described by Wilber. As for evolutionary purpose, McIntosh sees the same complementary relationship between holons with new language: the encompassed parts are of instrumental value, and the emergent wholes are of increasing intrinsic value. Smaller holons serve instrumental purposes and larger holons serve intrinsic purposes. From an evolutionary perspective, at a macro scale, what happens to purpose at different scales? For McIntosh, the intrinsic purpose, or value, of evolution itself is not static: “its value is ‘alive, free, thrilling, and always moving (McIntosh, p. 160). '” Yet is also moving in a direction, toward goodness, beauty and truth. Intrinsic purpose is grand and shifty. The process of growth, however, also involves parts that are no longer growing or emerging, yet they “nevertheless [contribute] to the growth of the emergent levels which encompass those parts as a foundation for further growth (McIntosh, p. 160).” The holons that are encompassed as parts of larger wholes are of instrumental value to the more complex system of which it is a part. Small holons are in service to larger, more significant holons. They are of instrumental purpose. Every entity is a whole and a part. Every entity has instrumental and intrinsic purpose. What is your intrinsic purpose? In what are you of instrumental value? The purposes I pursue are informed by what I value. The purposes we pursue are informed by what we value. Purpose and value drives both my decisions and those of the larger wholes of which I am a part. I am a whole system myself, and I find myself within the larger whole of my family. My family is a system within the larger system of our neighbourhood. My neighbourhood is a system inside the larger system of the city of Edmonton and its region. Edmonton is a system within the larger system of Canada, and Canada a nation of the world. Each system is whole and is also a part of larger wholes. Each system has its respective purpose and set of values, which may be aligned or disparate, but they each are live with purpose. Each scale will have a purpose that reflects its life conditions. 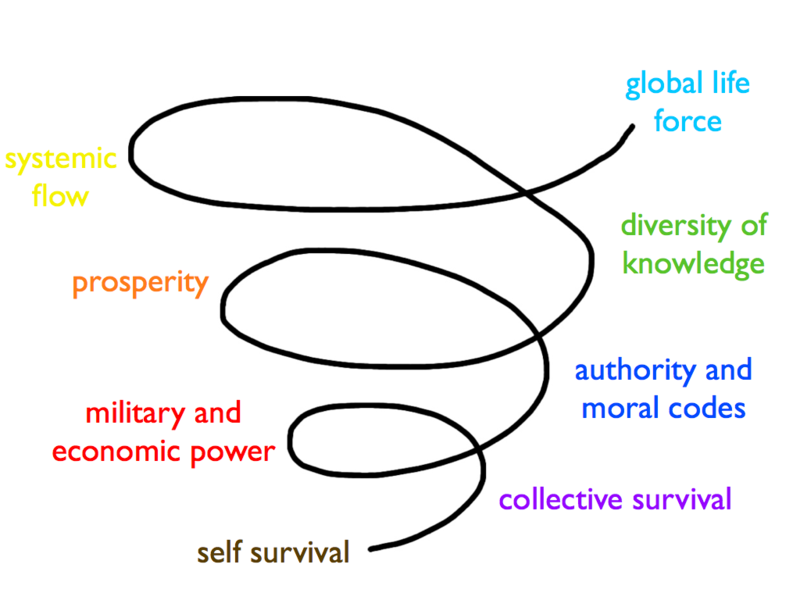 (See Figure B to see the Spiral; here is a primer on Spiral Dynamics.) While I value prosperity and creative entrepreneurship today (with the time I have to write), I recognize that the school and police systems in Edmonton are operating out of authority and moral codes today because of two teens who threatened, online, to hurt many people. Their actions have been taken seriously and they have been charged. Organizations across Edmonton are diving in to make financial contributions to the Edmonton Food Bank to ensure families have enough food this Christmas. They are guided by moral codes to serve folks in survival mode. And as we gather for upcoming winter festivities, whatever religion, we are engaging in long-held practices that bring communities together to bond for collective survival of culture. Others in my city are working on open data systems that help the city see itself, so we are able to explore more fully the diversity of knowledge at our disposal. Others yet see ways to make all of the above be healthy and vibrant, so we have a city that serves citizens well. A variety of purposes are alive at every scale, from the individual to the city to the planet and the Universe. Each scale of individuals and collectives, are reaching, as interested and able, into expanded purposes.